At a Glance: Culinary walking tour through some of San Diego's trendiest neighborhoods. Spend an afternoon sampling food from 4 to 5 restaurants in a small group of like minded food lovers. Wally Says: Whether you're a tourist or a local, if you love food and love discovering new places to eat then this is your type of tour. 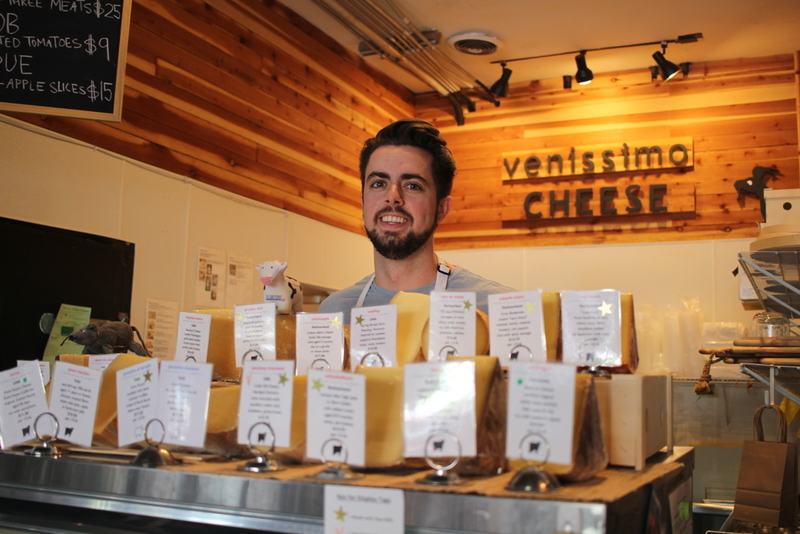 He cuts the cheese at Venissimo Cheese Shop in Hillcrest - wait, that didn't sound right but you get the idea! This is a pretty good idea! Bite San Diego is a food tour where you walk through various San Diego neighborhoods to taste what their restaurants have to offer. Started in 2010, BITE San Diego is an adventure for locals and tourists alike, really anyone who loves good food and wants to explore the San Diego food scene and maybe even learn a little history on the way. What's cool about this type of tour is that you discover cool restaurants that you might have walked right by in your past. For example, Red Wing Bar and Grill in Hillcrest has been described as a dive bar by some, a crazy gay bar by others. I'd never been in but so glad I did after sampling their insanely fantastic hot wings, washed down with a giant PBR. Really, you like wings you need to get in there! BITE San Diego has tours not only in North Park but Pacific Beach, Liberty Station, La Jolla, Encinitas, Downtown/Little Italy and Coronado. All of those areas have well known restaurants, places you've already been to, but that's not what BITE focuses on. Instead they find the eclectic and unusual, you know, the more foodie focused places that make you wonder why you've never been in before. Mention Crazee Burger to someone who lives in North Park and they'll tell you that this is one of the best burgers in town. But I had never heard of them. That's one of the problems in San Diego - it's so big, so spread out, that it's impossible to have the insider scoop on every neighborhood. But that's exactly what BITE does - it shows you where the locals in that neighborhood eat, their favorites. Our next stop was Berkeley Pizza North Park, a Chicago Style pie that has a crispy, buttery crust and lots of fresh toppings. Really great, authentic, and popular with the neighborhood locals. By now I was clearly stuffed. They call this a walking tour but you really only walk a mile and a half, maybe two total, over the entire afternoon so it's not like you're burning up calories like this was the Rock and Roll Marathon. So come hungry. Come super hungry, in fact. But come on, our leader shouted, let's move on to the next stop! We did a short pitstop to taste some lemonade at a coffee shop and then headed over to Splash Wine Lounge, a cool place where you can purchase a wine sample one ounce at a time. You insert a card, you push a button, and out comes your taste. It's a really great way to try some unusual wines. I wish Trader Joe's had this! And yes, food, more food, so much food that I could barely take a bite but there I was diving into a great flatbread. So. Stuffed! BITE San Diego says that this is supposed to be "bites', not a buffet, but really you need to be John Candy to not leave this tour feeling like you got more than your money's worth of deliciousness. So tourists, if you want to do something really unusual, if you love food, if you want to learn more about San Diego than the basic tourist stops, then pick a neighborhood and spend a few hours exploring the food scene with BITE San Diego. And locals, you'll love it too. Go discover a part of San Diego you might have overlooked - gather some friends and spend the afternoon on a BITE San Diego tour. You'll love it!